I’ve had the spinning wheel out again, attempting to spin chunkier yarn. Exactly as I was warned when I learnt to spin, once you can spin fine, it’s near impossible to spin thickly. I’m not even talking particularly thick – aran weight would be great, I’ve got lots of uses for that. I didn’t quite manage it but I’ve got pretty new yarn. Both skeins started out as undyed top from British sheep, both spun the same way and home dyed but with different results. 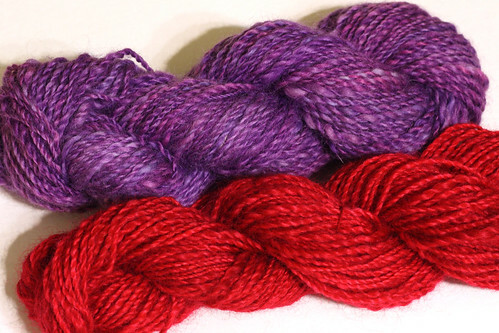 The purple skein is BFL, dyed as fibre. Different shades of blue and purple were poured in while it was in a tray before boiling, in order to achieve graduated colour effect from one end to the other. The dying process lead to very compressed fibre, which had to be teased out before spinning. The finished result is too subtle to be worth the effort, I probably wont vat-dye fibre again. However, the finished yarn is a pretty, bouncy, light aran. The second skein is Wensleydale, dyed as yarn. It was spun the same thickness as the BFL but I’ve ended up with DK because it hasn’t fluffed up as much. I’ve never spun Wensleydale before, it’s incredibly long staple and lustrous texture would make it perfect for beginners. The resulting yarn is silky and dense, and works perfectly with the intense, saturated shade. What I’m most impressed each skein was spun and plied in around 2 hours. It’s not so long ago that spinning 100 g would be a project that spanned a couple of weeks. Now I just have to decide on suitable projects for these. Any recommendations for 85 m of DK or 100 m of worsted? A couple things, I disagree with the statement that the vat-dyed yarn’s effect is too subtle to be worth the effort. My eye goes right to that yarn and I am totally enthralled with it. There’s a depth to the fiber and it pops, at least in the photos. Saturated color is, of course, much appreciated, but there is also the potential for flatness in it. This is great if you just want color to function as color, but when you want to get drawn into a yarn for its essence as well as its color, I go for vat-dyed yarn. Secondly, as to your queries, I am more drawn to the idea of designing with small quantities of yarn as contrast elements than as small projects. For the worsted yarn, for instance, you could do Wendy Bernard’s “Fair Enough” fair isle cardigan with a yoke neckline that could feature the purple worsted and one other contrast color of similar hue. The body of the sweater is of course completely up to you! (I am referring to patterns on Ravelry, btw.) Or use the yarn just in a portion of a project. Thanks so much for your ideas – I hadn’t thought of fairisle but it would be perfect! Now that the yarn has rested, it’s thicker than I imagined which gives me a few more options. I’m glad you like the purple colour, it is growing on me as well, I’m looking forward to knitting it up!